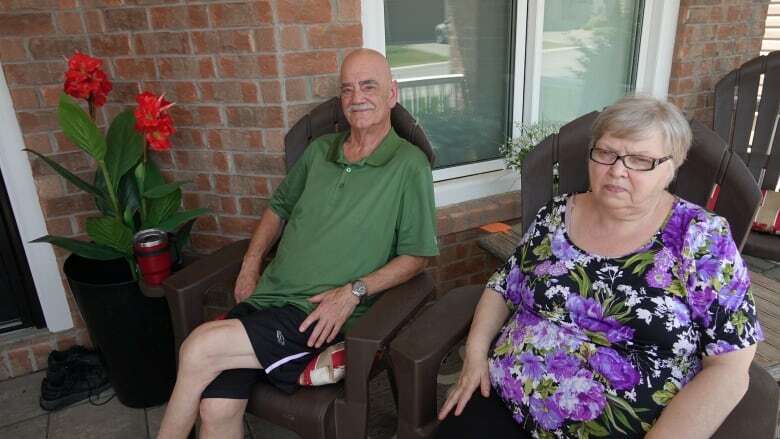 Residents of a suburban housing development in Ottawa's east end say they're worried their new homes are unsafe after discovering major construction defects soon after they moved in. The City of Ottawa confirmed building code violations were discovered in at least nine homes in the Cardinal Creek neighbourhood after the owners moved in, meaning the new homes didn't meet the minimum standard for health and safety. Different homeowners found issues such as cracked foundations, leaky walls, mouldy basements and garages, and evidence of deer mice, which can carry the rare but sometimes deadly hantavirus. The homeowners have been working with the builder, Tamarack Homes, the city and regulator Tarion to make the necessary repairs, but it's a slow process. In the meantime they can't sell their homes, and most can't afford to live elsewhere while they await repairs. "We have no choice. We're stuck here," said homeowner Julie Bellefeuille. Of all the homes CBC visited, Bellefeuille's appeared to be in the worst shape. Bellefeuille, her husband Marcel and their two children moved into the newly built home two years ago. They began noticing the problems as soon as they got the keys. On their first day in the house there was no hot water. A repairman found a vital valve missing from the tank and water spraying into the insulation. Later, the family noticed a cracked step in a staircase. 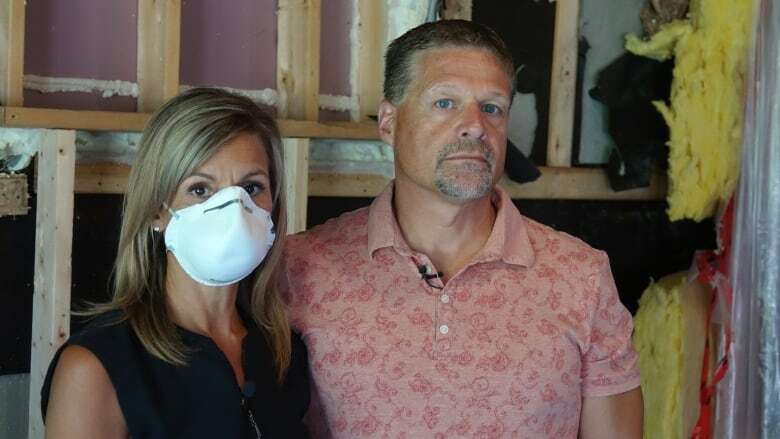 City inspectors have since confirmed more than 14 building code violations in the Bellefeuilles' home, which, according to a Municipal Property Assessment Corporation (MPAC) assessment requested by the couple, has dropped in value by more than $100,000 since they moved in. The assessment took into account construction quality, MPAC said. "It's been hard. It's been very frustrating, causing a lot of anxiety, sleepless nights," Bellefeuille said. They've spent thousands of dollars on private engineers and inspectors, and countless hours researching and writing to the city, the builder and Tarion. "The process is completely broken," Bellefeuille said. "People shouldn't suffer this way." Tamarack Homes refused CBC's request for an interview. The developer offered the family a $6,000 cash settlement last spring. The offer wasn't made to right any wrongs, but "in order to try to satisfy our customer," according to an emailed statement from the company. The Bellefeuilles did not accept the money. In the statement, Michelle Taggart, the company's director of development, said it's extremely rare for the builder to have to deal with ongoing complaints from customers. While some deficiencies are normal in new homes, Tamarack performs any reasonable repairs and will continue to do so for its Cardinal Creek customers, Taggart said. But Tamarack's relationship with the Bellefeuilles became difficult when the couple refused to give the builder sufficient access to the home to make necessary repairs, she said. The couple's own records show they've opened their doors to Tamarack employees on more than 55 days over the last two years. The Bellefeuilles are not alone. Down the street, 69-year-old William Hillier, who's fighting cancer, said he's also been fighting to have Tamarack make repairs to his new home. On Christmas Day, Hillier discovered a large puddle of water in his basement when he went to get some extra dishes for dinner. He pulled back the insulation to find a thick sheet of ice on the wall. A private contractor later confirmed the Hilliers have mould in the basement of their new home. Hillier, who recently underwent surgery to remove his bladder, said much of his recovery has been spent making calls about repairs to his house. The ordeal is not what the couple expected when they bought the house. "It's bad enough dealing with what he's going through. I don't need this on top," Colinette Hillier said. Five other Cardinal Creek homeowners shared their inspection reports with CBC, but opted not to do interviews out of fear for their property values. Some had also found mould in their homes. It's unusual to have so many homeowners in the same neighbourhood still dealing with potential building code deficiencies years after they move in, said John Buck, the city's deputy chief building official. The city inspects new homes at every stage of construction to make sure they meet building code standards. But in these cases the deficiencies were missed and the homes were granted occupancy permits despite the problems. "Our inspections are at a representative stage of construction," Buck said. "Our staff are there eight to 10 times during construction. We're not there 24/7." The city's roster of qualified building inspectors is currently understaffed by 10 to 15 per cent, and it's been struggling to fill those vacancies. The city is working with Algonquin College to try to provide more onsite opportunities for students. "Unfortunately it does sometimes take mistakes to be made for people to learn from those mistakes," Buck said. The city and Tamarack are starting to make progress on many of the homes, but the process to get them up to code can be long and frustrating for families, Buck said. Tarion, the agency mandated by the province to regulate Ontario's homebuilding industry and protect consumers, confirmed it's working with "a handful" of homeowners in Cardinal Creek to backstop their new home warranties. Typically, the regulator only gets involved when the relationship between the builder and the homeowner breaks down, said Tarion's Siloni Waraich. The disputes are rarely resolved quickly. "Trying to have conversations where all parties feel comfortable with the resolution, especially the homeowner, does take time," Waraich said. The process puts the onus on the homeowner to find and in some cases prove the problem. That can mean hiring independent inspectors, a costly proposition for many homeowners. "The financial strain on families is often horrific as they try to work through these problems," said Karen Somerville, president of Canadians for Properly Built Homes, a national homeowner advocacy group. "The stress this puts on families can be phenomenal." Somerville said she's worked with homeowners who've been fighting builders for a decade to have building code issues resolved. "It's not OK to have homeowners falling through the cracks," she said. In Cardinal Creek, homeowners are hoping for resolution, but some are wondering if they'll ever receive adequate compensation for the stress and worry caused by the deficiencies. "No one can give us that time back with our kids," said Marcel Bellefeuille. "That time is gone."